These are the some information you are not aware about Facebook. Even who are the daily user of Facebook also don’t know about these feature of largest social network so called Facebook. By using Facebook you create a database which mean every single user on Facebook have a some sort of data on Facebook server that includes your chats messages , your photos , your friend name list you all active session of Facebook with their ip address information. So if you accidently deleted you chat you can also recover chat message from it. If you want to download all of your Facebook information on your computer you can get it easily by following this instruction. Messenger on your android device or IOS device which you only use to chat with your friends, you can also use messenger on your Computer. Wants to only chat with your friends because Facebook notification are too irritating to you. People who are for apart from you or they are not directly connected to your Facebook account they can’t see add friend option on their timeline. Because Facebook allow everyone to only add those who you are really close to you. If you want to add some foreign friends then you may be suffer this problem. Then you inbox them but you message don’t go to their inbox. That message goes to their spam folder or called hidden inbox which is usually not easily visible on Mobile Messenger. User who are using Facebook account on Website or accessing messenger on Computer they can see spam folder. So that you can visit who really unknown message you. With the passage of time by updating and adding new feature start making Facebook more attractive to their user. And hence number one social network up till now is Facebook. You don’t have to go to notification bar then click on it and a whole new page load on your tab which takes your data and then you reply to your friends comment now you can reply on notification box without loading notification post. 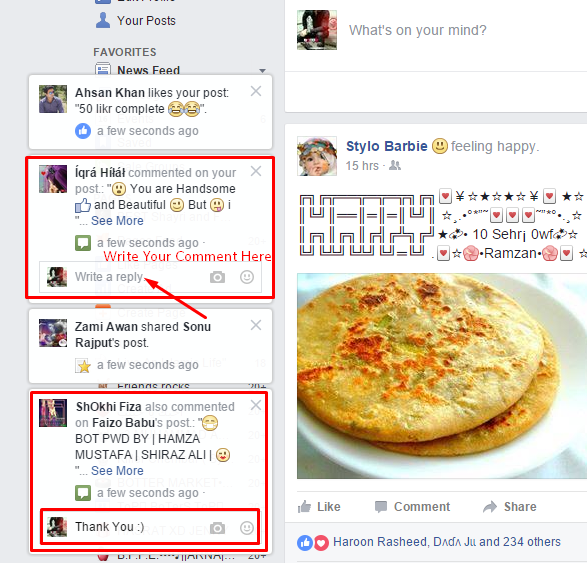 See this example for web Facebook user. After party with your friends want to send picture to your friends on Facebook. Here you can easily edit your picture in inbox with any software or any other site. Its hidden feature of Facebook many of user don’t aware of it because they attach upload picture to friend inbox and when it uploaded they hit the enter button which causes to send it to friend immediately. 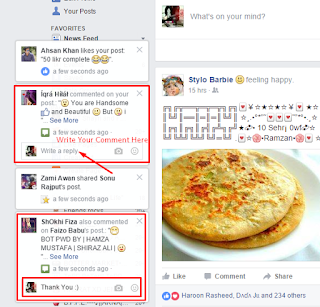 But here if you want about 2 second you will see editing picture feature of Facebook.